This story may be considered as an example of traditional practices by the community in North East India. 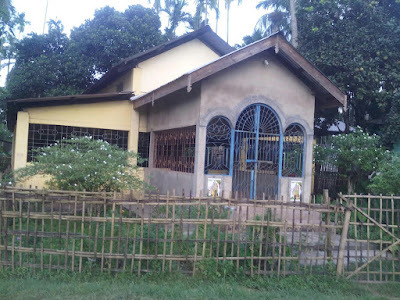 The Naam Ghar (Temple) in Khaloibari village under Kamrup Metro District of Assam is a religious place for worship with a difference. As per an age old practice, the temple receives 12,600 kg of paddy annually from around 105 households. 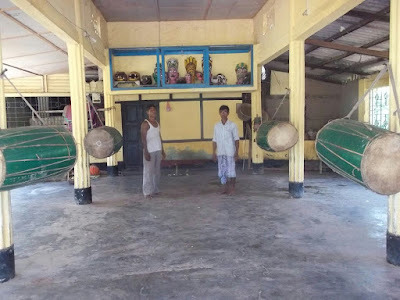 This practice perhaps sets this village apart from others where the community is up in arms in conserving the age old practice of donating paddy for a good cause. “I can’t remember exactly when this system came into being but I have seen my parents donating to the Temple & so do I,” said Keshab Das, septuagenarian from the village. Since time immemorial, the families from these households traditionally donate paddy each year to the temple granary during the month of December after the end harvesting of Shali paddy season. Shali is a local name for a paddy season & is generally carried out from July to October - November of a particular year. The Naam Ghar has a committee in place that takes care of the smooth functioning of its activities. This committee is respected by all in the village. The committee also has a role in selecting people for development activities in the village. The office bearers in the farmers’ club under FARM North East have also been selected by the Temple committee consultation with the community. As per the prevalent customary practice, every household donates 60 Kg of paddy to the temple granary. The committee looking after the temple would take a call on how to utilize the paddy. “Generally we take a collective decision on how best we can utilize the grains stored in the granary, we also take all precautions to upkeep the condition of the granary so that the grains remain fresh,” said Dandi Deka. As per general practice this paddy is used for public feast in various festivals that the temple organizes every year. The surplus amount of paddy is generally sold out in the local market & whatever is earned is used in Temple related activities like maintenance & others. The age old practice of this Temple ensures that the members of the community are regularly donating grains to the temple. The committee has a strict system in places that imposes a fine of double the quantity of paddy if any individual fails to donate during a current year. This individual would have to donate 120 Kg of paddy as a penance. However, this system has one more unique attribute. The Temple would come to rescue a person in distress. In case anyone in the village is downtrodden & hit poverty, the temple would take the responsibility of feeding this family by unleashing the doors of its granary. “We try our best to see to it that if a particular family is struck by poverty, we provide them with immediate relief & continue doing so until the family stands on its feet”, said Sureshwar Medhi, Secretary of Naam Ghar (Temple) Committee. This story may not talk any project interventions under FARM North East. It is a documented case of traditional practice by the community & it talks about divinity leading to humanity.